I have become a monster. Not the googly one-eyed, slime-slinging sort or the ever-popular Cookie sort (who can’t be all bad because he likes cookies so much), but the Yelling-Mommy sort, which is much worse. My first instinct upon seeing red-zone-bad behavior from my older son is to yell…even though we, as a family, have established our home as a No Yelling Zone. I broke the rules. How can I expect Bigs to effectively work through his emotions without yelling, when he sees me do it? It’s been a rough year, with him turning 3 and existing in that perpetual limbo of listening to us and doing what he wants. It’s hard. Some days I feel like he should be more thankful for the things I do for him. Like yesterday. 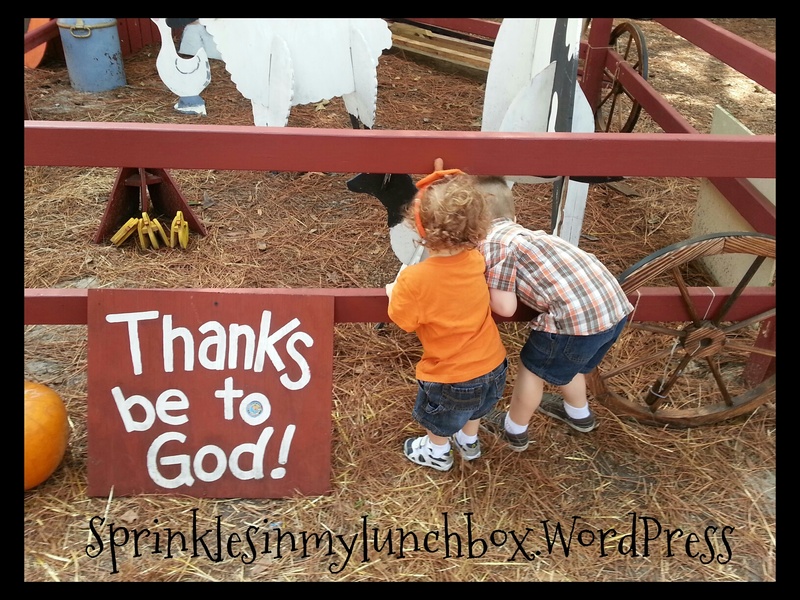 I took him and Smalls to a local church’s pumpkin patch, at which he threw a tantrum. At a pumpkin patch (one of THE happiest places)…at a CHURCH. For crying out loud (literally…that’s what he did…very loudly). I stuck it out. Ride or die (and die a little inside, I did). But, I need to remind myself that he is 3. I expect too much from him. And, oppositely, he far exceeds my expectations of what a wonderful child should be. Later, in looking through the pictures I took of my boys at the patch, I ran across one that stood out. It served as a reminder to me that there is a bigger picture. My son will not act like this forever. He will grow out of it. It is his age, and everything that comes with being 3, that is making things difficult. Not directly him. He and Smalls are my blessings. And I am so thankful for them. I need to remember the bigger picture when dealing with the tantrums. Thanks be to God for these little blessings! Oh! 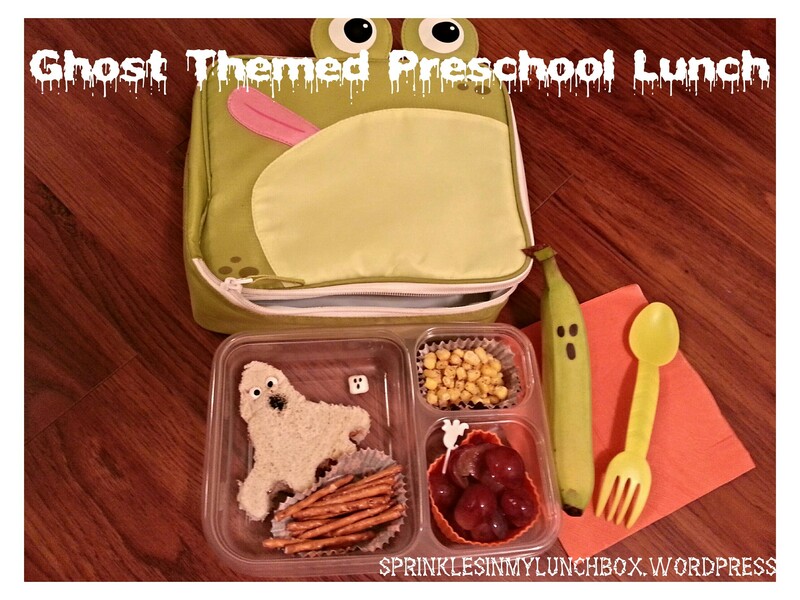 And also, today I made a Halloween themed lunch for Bigs for school. Ghost themed, to be more specific! OooooOooh! He said it was so fun and that everything was “ghosty” and “looked at him”! Made my day! It was a ghost-shaped PB&J (I used googly eyes and Food Writers), pretzel sticks, seasoned corn, grapes and a teeny marshmallow ghost (Food Writers) for dessert. And the ghost banana was for snack. Connor wasn’t easy at that play date either and I hate being the mom that YELLS , so I left and it worked . I try and remember he is three but even at three they need discipline and boundaries . BUT , like you, I looked back on pictures and captured some beautiful ones and my heart hurt on how such a fun day turned into a bad one..
It’s absolutely true… Kids depend on boundaries even if they don’t like them. It’s a rough age for sure. Hugs! Thankfully we have each other to lean on when we need to cry ! Some days I feel like I do everything wrong and it’s nice to have other mothers admit that too. Thank you for this blog .